An old quirk in Windows is going away with the release of Windows 10. Microsoft has revealed that the upcoming release of Windows 10 will include a change that makes the Windows NT kernel jump to version 10.0. While Windows 8.1 was Windows NT 6.3 and Windows 7 was Windows NT 6.1, the numbering scheme will now match both the version and marketing names. 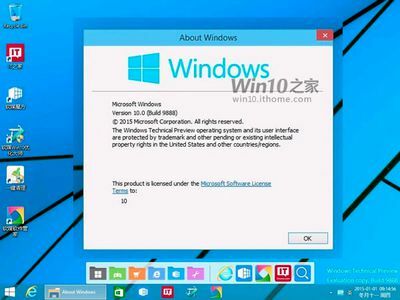 Windows 10 Technical Preview builds are currently identified as Windows NT 6.4, but future builds will include the change, and Chinese site ITHome leaked images showing the 10.0 version of Windows 10 last week. The odd numbering scheme originates from Microsoft’s merging of NT and DOS-based versions of Windows. It left software like Windows 2000 with the 5.0 version number after years of Windows 2.0, 3.0, 3.11, and 4.0 releases eventually merging alongside versions like Windows 95 and 98. Microsoft kept the NT numbering scheme to identify a major version to applications for compatibility. Ars Technica has a good explanation of how Microsoft is finally able to use version 10.0 instead of 6.4, allowing apps to remain compatible in future. While this doesn’t indicate Microsoft’s release of Windows 10 is any more significant than previous versions, the move will remove some confusion and the many Windows numbering jokes that have appeared over the years.